The Elantra has earned strong reviews and sales, helping Hyundai to increase its market presence in the critical U.S. sector. DETROIT -- Hyundai plans to reveal an Elantra coupe in February at the Chicago auto show as the company tries to capitalize on continuing sales momentum by fortifying its product line. Hyundai Motor America CEO John Krafcik showed reporters the Honda Civic-fighting car today at an event near Ann Arbor, Mich., though photography was not allowed. The Elantra coupe would be joined by a redone version of the Touring model, which currently is a small wagon. The updated Elantra sedan has earned strong reviews and sales, helping Hyundai to increase its market presence in the critical U.S. sector. 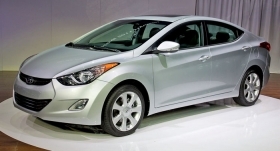 Hyundai sold 160,922 Elantras in the United States through October, a 46 percent gain over the same period of 2010. "This car has been great for us," Krafcik said. "It has really surpassed our expectations." Details on the coupe were not available, though it has a similar instrument-panel layout as that in the sedan. The back seat is also surprisingly roomy, and the materials are of high quality. It will also have different gear ratios for a sportier drive character. Hyundai plans to launch a turbo Veloster, an Elantra Touring and coupe, a Santa Fe, an Azera and a Genesis coupe in 2012 as part of an ambitious product blitz. Hyundai may market the redesigned Elantra Touring as a 5-door hatchback. The current car is marketed as a wagon. The 5-door hatchback goes on sale next summer and will be assembled in Korea. Krafcik would not say where the Elantra coupe will be assembled. Rick Kranz contributed to this report.